If you are looking for an affordable scope that is still capable of providing you with the performance you need in the field, you might want to consider this 4×32 model from TRUGLO. It is designed for accuracy and durability, and it also comes with a limited lifetime warranty. This scope is also easy to sight in, and comes with special compensating reticle that will help ensure every shot is consistently accurate. Even though this scope is designed to be compatible with most crossbows, some consumers have noted that it can be difficult to mount. If a wrench or other tool is not used to tighten it down securely, the scope can become loose and potentially fall off. While this is not always an issue, it is something you might want to consider depending on the make and model of your crossbow. 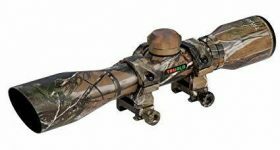 Not only does this crossbow scope from TRUGLO come with a durable construction, it is also backed by a limited lifetime warranty. 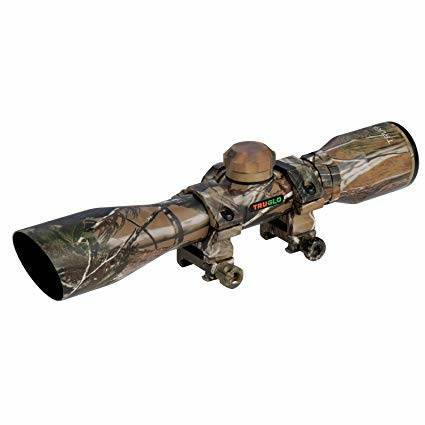 This ensures that you will consistently get the same great performance for the life of the crossbow scope. The single tube is constructed from the same aluminum that is used in aircraft so you know that it will last for years. The leaf spring for adjustments is also designed for durability, and is resistant to bending or breaking. The scope also comes with a professional matte finish that won’t reflect any light that might startle nearby prey. Resistant to scratches and designed to be used in almost any weather, this affordable scope will easily make it through the whole season with you. With its low price you might think that you are sacrificing on optic quality, but this is not the case with the TRUGLO 4×32 scope. The lenses are fully coated to allow plenty of light through, and to ensure images are crisp and clear. The coating also helps to alleviate any problems with fog or moisture which can cause lenses to cloud over in the early morning hours. You will appreciate the 4 inch eye relief that makes it easy to see a target at a glance, and the rubber guard helps to prevent any painful bumps. With 4×32 magnification you can easily see distant targets and the reticle ensures you know exactly where to aim to make a humane killing shot. The reticle can be easily adjusted for range and trajectory, which makes this scope ideal for firing down on targets from a tree stand. This crossbow scope is designed to be easy to use, even when you are in the field. It can be easily mounted onto almost any crossbow, and you don’t need to worry about following any complicated instructions. Simply tighten the scope down and you are ready to go. When you need to make adjustments for wind or elevation you won’t need to grab any additional tools. There is a small leaf spring that you can easily move with your finger so you will always know the right trajectory for your arrow to follow depending on the range. When you know the path your arrow should take it is easier to hit the target exactly where you want to. Since it is also designed to hold at zero you might not have to make complicated adjustments that might distract you from the hunt. This affordable crossbow scope is designed to be durable and to make it easier for you to see targets at a distance. It is water and fogproof so you don’t have to worry about a loss of visibility, and since the lenses are fully coated images will always appear bright and clear. You will also appreciate how easy it is to sight in and adjust, especially in the field. While this might not be the highest quality scope, it is an excellent choice for your money.